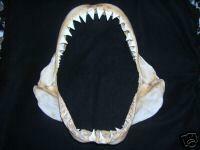 Thanks to the sharp eyes of blog reader "Samir" we were notified this morning of this recent shark travesty on eBay. The current bidding is $1750 USD but will always go much higher if left to market driven buyers. The last set of jaws we saw on eBay a few years ago was a $5000 prior to our email campaign. If you have a chance today, and you want to do some good, here’s the sellers eBay contact info.